UN High Commissioner for Human Rights Zeid Ra’ad Al-Hussein. The top United Nations human rights official today expressed alarm at the imposition of the death penalty on Mohammad Ali Taheri, the founder of a spiritual movement, writer and practitioner of alternative medicine theories used in Iran and abroad. “Taheri's multiple convictions on a variety of vague charges, his alleged detention in solitary confinement and now his sentencing to death bring into stark focus serious issues with the administration of justice and the terribly worrying use of the death penalty in Iran,” UN High Commissioner for Human Rights Zeid Ra'ad Al Hussein said in a press release. Taheri was sentenced to death on Saturday by the Revolutionary Court on a charge of Fesad fel Arz (corruption on earth). “Iran's use of the death penalty has long been problematic, with many executions on drug offences, several executions of people who were below the age of 18 when the crime was committed, as well as other cases where broad, ill-defined charges led to the imposition of capital punishment,” Zeid added. The High Commissioner stressed that under international law, and in particular the International Covenant on Civil and Political Rights, ratified by Iran, in countries which have not abolished the death penalty, it may only be used for “the most serious crimes” which has been interpreted to mean only crimes involving intentional killing. Even then, the case has to meet stringent fair trial standards. “I call on the Iranian authorities to immediately withdraw the charges against Taheri and ensure his unconditional release. For an individual to be sentenced to death for peaceful exercise of freedom of expression, religion or belief is an absolute outrage – and a clear violation of international human rights law,” High Commissioner Zeid stated. “I urge the Government of Iran to immediately impose a moratorium on all executions and to work with us and other partners on alternative strategies to combat crime,” the UN rights chief demanded. 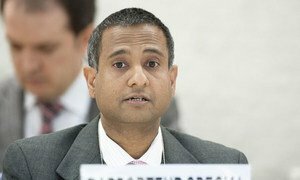 For its part, the UN Special Rapporteur on the situation of human rights in Iran, Ahmed Shaheed, urged the Iranian authorities to immediately commute the death penalty handed down to Mr. Tehari. “It is unacceptable and a clear violation of international law for an individual to be imprisoned and condemned to death for peacefully exercising his rights to freedoms of religion and of expression,” the UN expert stressed. Mr. Shaheed's call has been endorsed by the UN Special Rapporteurs on freedom of religion or belief, Heiner Bielefeldt; on torture, Juan E. Méndez; on extrajudicial executions, Christof Heyns; on freedom of opinion and expression, David Kaye; and on human rights defenders, Michel Forst. Two United Nations human rights experts have condemned the sharp increase in executions across Iran in recent weeks, urging the Government in Tehran to heed the Organization's appeal for an immediate halt on the use of the death penalty.